The park has some good qualities, along with close to the ocean. The biggest disappointment is the wifi barely working order even with a booster. Kids are running all over, trashing the bathrooms and unsupervised. This is definately a Summer stay location. The location is well estabilished however the bath interiors need updating. This location had no shower heads, force of water planned to be stingy. The location of the clothes hangers are located outside of the individual shower stalls. O.k. Nov is off season possibly however now days you have towels or clothes,shoes cannot be left out of site for theft no matter where nowdays. Too much of any inconvience when you can dress inside the stall.The flooring is outdated where again sand, dirt adds to getting it on your wet feet. Too much sand to transfer into the RV. If your a beachy type and want to clean sand and plan to stay in a swimsuit and in a wrapped towel this is for you. We stayed at Pirateland for 8 days and had a wonderful time. The park is well mainlined and staff is friendly. Trash pickup everyday at sites. The sites are not small, but some of them are close to each other on the back side. We stayed at one of the only sites with a concrete pad. The majority of the park is grass and sand. The WIFI there is not very good. I was only able to connect a few times during the entire stay. 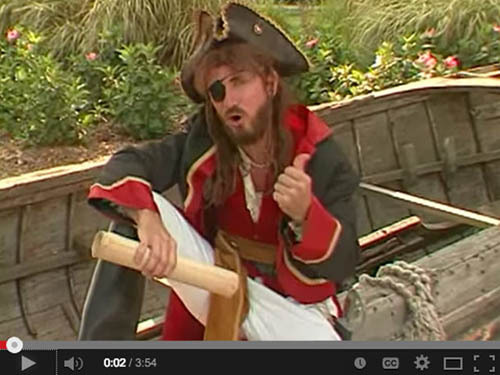 There is plenty to do at Pirateland. The park is located right on the beach. There is also an indoor and outdoor pool, hot tub, miniature golf and we really enjoyed the lazy river. If you plan on doing a lot in the park you will probably want to rent a golf cart because the place is huge. Overall we had a good time there and plan to go back next year. 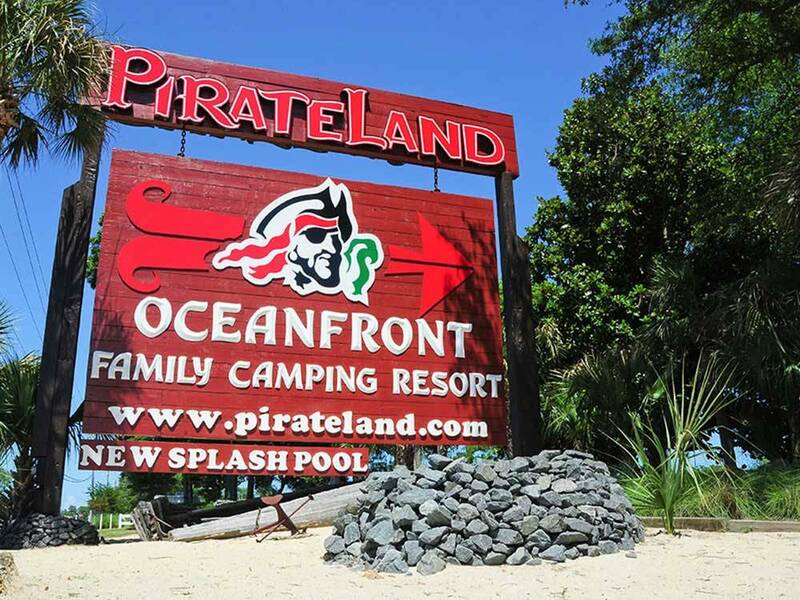 We had the most wonderful stay at Pirateland during 9/16 after the vacation season was over and kids were back in school! The park has some pretty strict rules like NO FIREWOOD at all and no motorcycles in the campground. We really appreciated the peace and quiet of no motorcycles, but were disappointed about not being able to have a campfire. We wanted to stay an extra day beyond our original booking and they were so kind to accommodate us and we ever got a BETTER spot closer to the beach. We did not visit the pool or lazy river but they looked super cool. We did not visit the bathhouses either. I've been coming here for 30 yrs off and on. The off years I didn't own an RV. It's been the same place all this time. It never disappoints. Will probably never go anywhere else in Myrtle Beach. On y revient à chaque année pour un mois. We stayed here for 2 weeks in July of 2015. 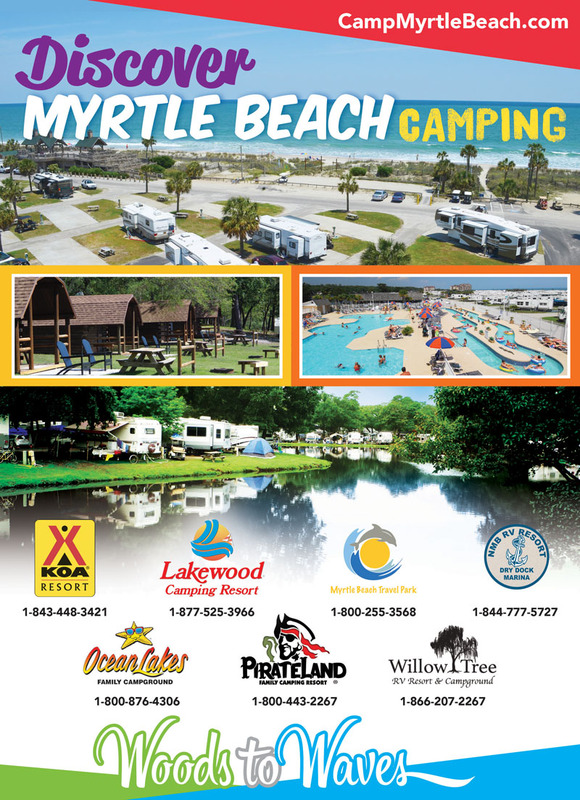 Campground is clean, great pool, nice beach area. We never used restrooms. WIFI could have been stronger. Sights were wide enough to handle our 34ft 5th wheel, but the road between the rows is narrow and it was difficult getting into the sight. The sight we were on was 4 sights from the beachfront and was sand. No pavement in the sight. Sand had huge ruts, that should have been raked out after the last guest moved prior to our arrival. It made it difficult to get level. There is a sun shelter with a picnic table at each sight. You can string a clothes line to the shelter, or block off with a tarp adding to the shade, but the breeze is generally blocked. Campground is clean, trash is picked up at sight a few times a day. Staff is friendly and helpful if you ask. I should have asked about the sand in our sight prior to setting up. Convienent to attractions, great pool, different on sight food vendors daily...Plenty to do for the kids. My 11 year old made friends quickly and was busy enough each day that he slept like a baby each night! We plan on 2 weeks again in August of 16 (sight is booked) while we are in town for a baseball tournamnet at The Ripken Complex. We enjopyed it so much that family members and friends are towing down vacation with us! RAKE OUT THE SIGHTS PIRATELAND after others depart! We spent a week on an end, drive thru site. Utilities were on curb side of rig so had to go around and under. Glad I had extra hose, etc. Cable tv was horrid so used antenna. Park is huge and on the ocean. A very short walk to beautiful beach. Really geared toward families with tons for kids things to do. Restroom and shower was just so-so. Great pool/play area. Tons of good restaurants in the area. We will return to the area but will try a different park. Oceanfront location. Our amenities offer something for everyone. We have a lazy river, Olympic size pool, a Pirate Ship Splash Pool, scheduled activities and more! Fall through spring we're a great destination for snow-birds.